Do We Need Another 9/11 Conspiracy Theory? The terrorist attacks of September 11, 2001 were a turning point in world history. We have been told that these attacks were planned and implemented by nineteen Arab Muslim hijackers under the direction of the leaders of al Qaeda. According to the official account, this criminal conspiracy received no help or funding from any government. Unfortunately, this explanation fails to address a majority of the evidence and leaves most of the critical questions unanswered. In fact, the reports that constitute the official account do so little to explain what happened that it is possible that, to this day, we know very little about who was behind the attacks. That fact is alarming to many people, given that so much war and unprecedented change has been driven by the official account. 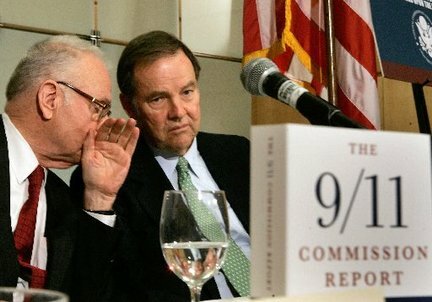 On closer inspection, the 9/11 Commission Report provides only 90 pages of discussion about what actually happened on the day of 9/11, found in chapters 1 and 9 of the report. The remainder of the report is devoted to promoting a myth behind the organization called al Qaeda, and suggesting what to do about it. Author David Ray Griffin revealed that the Commission report not only failed to provide the fullest possible account, it omitted or distorted many of the relevant facts. The Commission report also gave us a new explanation for one of the most alarming aspects of the attacks — the complete failure of the U.S. national air defenses. The new explanation represented the third, distinctly different, version of how the air defenses failed. A number of excuses were given by Commission members for the shortcomings of its report. In their 2006 book, Without Precedent, the leaders of the Commission, Thomas Kean and Lee Hamilton, said “we were set up to fail.” When I met with Hamilton, he told me that the Commission faced too many questions, too little funding, and too little time. But the fact is that, if it had not been for 9/11 victim’s family members working diligently to publicize problems with the emerging official myth, there would never have been a 9/11 Commission investigation. Both President Bush and Vice President Cheney actively sought to limit the investigation into the attacks. When the political pressure caused by the victim’s families grew too great, the 9/11 Commission was born. But the Commission was given less than one tenth of the funding that had been allotted to investigate the sexual exploits of President Clinton just three years earlier. Clearly, the U.S. government did not want an in-depth investigation into 9/11. There were several brief inquiries early on. These included the CIA Inspector General (IG) inquiry, the FBI IG inquiry, and the Joint Congressional Inquiry. All three of these were focused on a limited hangout viewpoint of the shortcomings of U.S. intelligence agencies related to the alleged hijackers. The 9/11 Commission, which stated its goal of presenting “the fullest possible account” built its work on the earlier inquiries and used many of the same staff for its investigation. To lead the Commission, President Bush first appointed Henry Kissinger. As with the 14-month delay in getting started, this appointment was a strong indication that the investigation was not intended to be a fact-finding mission. Kissinger’s refusal to release his client list, which was expected to include the name Bin Laden, forced his resignation and replacement by Kean and Hamilton. Kean’s ties to the oil and gas industry and Hamilton’s history as an intelligence agency insider, along with similar conflicts of interest among the rest of the Commission members, were issues that remained unaddressed. The Commission’s report came out nine months later, in July 2004, and was hailed as a great achievement by the publicists hired to promote it. Unfortunately for the rest of us, the report failed to answer 70% of the questions provided by the 9/11 victim’s families who had inspired the Commission’s charter. The 9/11 Commission took this “we found no evidence” phrase to an extreme and used some form of it 36 times within its report. Four of those instances highlight the fact that the 9/11 Commission could not explain how any of the alleged hijackers entered the cockpits of any of the four hijacked planes. Other instances reflected that the Commission put almost no effort into allegations of insider trading, or how the attacks were funded, which the Commission said was “of little practical significance.” In an honest investigation, the funding would be seen as a strong clue to who was behind the attacks. Although the Commission addressed the World Trade Center (WTC) in a brief, superficial manner, the detailed explanation for what happened to the Twin Towers and WTC Building 7 was left to the National Institute of Standards and Technology (NIST). At the time, this agency reported through the U.S. Department of Commerce under the direction of Bush’s old friend and oil industry colleague, Donald Evans. Like the 9/11 Commission Report, the NIST reports, which were issued in 2005 and 2008, represented only the last in a series of failed official explanations for the destruction of the WTC buildings. NIST avoided much of the evidence for what happened to the buildings by providing only a “collapse initiation sequence” for the towers, and by performing no physical testing to support its unusual explanation for WTC 7. The timing of NIST’s WTC 7 report appeared to be scheduled for dual political purposes, to coincide with the seventh anniversary of 9/11 and to give the appearance of finished business at the end of the Bush Administration. That is not surprising, as the timing of NIST’s other reports coincided with political events as well. These included the draft report on the towers in October 2004 – just before the election, the final report on the towers – just before the fourth anniversary of 9/11, and NIST’s first “responses to FAQs” – just before the fifth anniversary. All of them appeared to involve politically motivated release dates. In each case, the dates allowed time for the mainstream media to quickly present the official story while public interest was high, but did not allow time for critical questioning of the related documents, which were extensive and deceptive. With the WTC 7 report, the public was given just three weeks prior to 9/11/08 to comment on a report that was nearly seven years in the making. With time it was discovered that the WTC 7 report was a very poor attempt at a realistic explanation for what happened to that 47-story building, which had not been hit by a plane. It seemed that NIST didn’t even try to present a logical explanation for what happened, but simply relied on the idea that a fawning media would help them close the public discussion quickly. In the future, people will learn a great deal from the NIST collaboration with certain media, in terms of our present culture and the extent of our ability to deceive. Among those who still trusted the official account were some who insisted that, if there was much more to the story of what happened on 9/11, the media would have latched on and reported the issues diligently. The History Commons 9/11 Timeline, which can be found online, shows that the mainstream media did, at first, report many interesting facts about 9/11 that did not end up in the official account. Those facts were never followed-up or were quickly forgotten as the official myth was formed and reformed. Attempts by some media sources to support the official accounts led to an increasing suspicion that something was being covered up. Hearst Publications, the British Broadcasting Corporation (BBC), and Skeptic magazine, are examples of media that went to great lengths to stifle any questioning of the official account and divert attention from the glaring discrepancies. Such official story champions focused their efforts around the term “conspiracy theory” and its variants, which they liberally applied to any attempts made by independent researchers. Ironically, this was despite the fact that the only 9/11 conspiracy theory of any consequence had always been the official account. The use of “conspiracy theory” to deter citizens from investigating historic events is paradoxical, to be sure. It suggests that those who commit criminal conspiracies can only be relatively powerless people who happen to live on the most strategically important lands, and conspiracies among rich, powerful people are impossible or absurd. Basically, our entire legal system is based on the idea of conspiracy. Despite this fact we have been conditioned by the government and the media to blindly accept the official reports and to treat any questioning of those reports as “conspiracy theorizing.” That is, you are a conspiracy theorist if you don’t believe the government’s conspiracy theory. This cultural phenomenon goes back to 1967. At that time, in response to questions about the Warren Commission Report (which President Ford helped create), the CIA issued a memorandum calling for mainstream media sources to begin countering “conspiracy theorists.” In the 45 years before the CIA memo came out, the phrase “conspiracy theory” appeared in the Washington Post and New York Times only 50 times, or about once per year. In the 45 years after the CIA memo, the phrase appeared 2,630 times, or about once per week. Before the CIA memo came out, the Washington Post and New York Times had never used the phrase “conspiracy theorist.” After the CIA memo came out, these two newspapers have used that phrase 1,118 times. Of course, in these uses the phrase is always delivered in a context in which “conspiracy theorists” were made to seem less intelligent and less rationale than people who uncritically accept official explanations for major events. There is no question that criminal government-sponsored conspiracies exist. History is replete with them and they usually involve the government claiming that the country was under attack from “terrorists.” This was true of Hitler’s Reichstag fire and it was true of the attacks that occurred in 20th century Western Europe under the guise of Operation Gladio. An example more relevant to 9/11 was the conspiracy behind Operation Northwoods, a plan drafted and approved in 1962 by the highest levels within the U.S. military. Author James Bamford wrote of Operation Northwoods that it called “for a wave of violent terrorism to be launched in Washington, D.C., Miami, and elsewhere. People would be framed for bombings they did not commit; planes would be hijacked. [This would provide] the public and international backing they needed to launch their war.” The signed documents are available to everyone today and because of this we know that high level U.S. government representatives do conspire, on occasion, to commit crimes against the American people for the purpose of starting wars. Another claim made by those who fend off questions about 9/11 is that the official conspiracy theory is more plausible than it seems at first sight because it involves only a small group of conspirators. That is, it includes only 19 alleged hijackers directed by Usama Bin Laden (UBL). Of course, we must include Khalid Sheik Mohammed (KSM) because the 9/11 Commission Report called him the architect of the attacks. Over the years we have also been asked to consider the roles of Zacharias Moussaoui, Mohammed al Qahtani and the other four KSM colleagues who will be tried in military courts in the coming year. Today, we don’t have an alternative to the official conspiracy that spells out how the events of 9/11 are explained as a result of a conspiracy among insiders. Yet, at the same time, we know it is impossible that those within the popular version of al Qaeda could have shut down the U.S. air defenses for two hours on 9/11, or destroyed the WTC buildings. Is it possible to propose a compelling alternative conspiracy based on the involvement of insiders? Could certain corporations, government representatives, and other covert operatives have been involved? Requirements for such an alternative conspiracy to be compelling would include that it address more of the evidence and answer more of the questions about what happened, while not overly complicating the conspiracy. If we examine the events of 9/11 in terms of what should have happened that did not, and what should not have happened that did, we can focus a little better on who might have been involved. At a minimum, the following statements of fact must be addressed by any alternative conspiracy. • The many opportunities for U.S. intelligence agencies to track down and stop the alleged hijackers should have resulted in the attacks being stopped before 9/11. • The four planes should not have been hijacked because the systems in place to prevent hijackings should have been effective. • The U.S. chain of command should have responded to the attacks immediately but it did not. • The U.S. national air defense should have responded effectively and some, if not all, of the hijacked aircraft should have been intercepted by military jets. • The three WTC buildings should not have fallen through the path of what should have been the path of most resistance. In addition to addressing these problems, an effective alternative version of 9/11 would better explain facts related to Flight 77 and the Pentagon, Flight 93, and ancillary issues like 9/11 insider trading. For simplicity, this alternative conspiracy should accept as much of the official account as possible, including that the alleged hijackers were on the planes. However, it should also pay attention to the question of who benefited from the attacks, which the official investigations did not cover well. The benefits realized by al Qaeda should be compared to the benefits realized by those within an alternative conspiracy. The official account claims that UBL, KSM and the alleged hijackers went to great lengths to plan and implement the 9/11 operation for reasons of revenge and symbolism. This explanation does not make a great deal of sense considering that the Arab Muslim world has suffered greatly as a result of the attacks. The only ones who have benefited in that region are the ruling royal families of countries like Saudi Arabia and Kuwait who have long collaborated with the West. Those minority groups have benefited from the War on Terror because it has temporarily protected them from regional threats like that posed by Saddam Hussein and from other challenges to their positions of power. The attacks of September 11 were an act of war meant to gain control over others. That’s true no matter what conspiracy you buy into. If you accept the official conspiracy theory, that 19 Arab hijackers committed these crimes under the direction of UBL and KSM but with no help from any government, then the war was a religious jihad and the jihadists wanted to control the behavior of the US government. Yet if you learn more about the facts, including that the alleged hijackers were not religious Muslims but were people who took drugs, drank alcohol and dated strippers, then you better see the need for another explanation. Add to this an understanding of how incredibly lucky the alleged hijackers would have had to be to even begin accomplishing everything the official account gives them credit for, and the need for better answers grows. If the 9/11 attacks were accomplished as a result of an insider conspiracy, then several implications become obvious. First, the evidence which was omitted or distorted by official investigators might lead to revealing the true conspiracy. Secondly, any examples of avoidance or obstruction of those investigations would give good leads on the true conspiracy. Owning up to the possibility that we were so grandly manipulated is not easy though. The psychological barriers to examining these questions can be difficult to overcome. It doesn’t get easier when we realize that the official 9/11 narrative has driven many other crimes, including the deaths of countless innocent people. If an insider conspiracy for 9/11 was found to be true then we would have to assume that 9/11 was probably not the first time we have been fooled. Historical events such as the “October Surprise” holding of the hostages and the Iran-Contra crimes (both investigated by 9/11 co-chairman Lee Hamilton) might shed light on a system that periodically subverts democracy for its own purposes. In this scenario, the public narrative behind al Qaeda, which was crafted and promoted for many years by “terrorism experts” like Brian Michael Jenkins and L. Paul Bremer, would be a matter for investigation. No doubt the extraordinary roles that both Jenkins and Bremer played in aviation security and at the WTC in the years before 9/11 would also be of intense interest. Overall, it seems that an insider conspiracy had a much more believable motivation — the seizure and long-term maintenance of uncontested power. Such a conspiracy would have represented the interests of multi-national corporations and multi-generational powerbrokers who have benefited, beyond imagination, from the 9/11 attacks. If honest investigators worked together to propose an alternative that better matched the evidence, we might move closer to truth and justice for the victims of 9/11 and the 9/11 Wars. This could conceivably also put the true conspirators on notice, as they might still be out there today engaging in unknown crimes. Doing so, however, would finally make the absurd accusations of official story supporters come true – we would finally become conspiracy theorists. On the other hand we might never know the truth if we wait for another government investigation. This entry was posted in 9/11. Bookmark the permalink. 17 Responses to Do We Need Another 9/11 Conspiracy Theory? Kevin, Good article. I’m writing a book on 9/11 and have addressed the “conspiracy theorist” meme. Would like to know your source for the following: “In the 45 years before the CIA memo came out, the phrase “conspiracy theory” appeared in the Washington Post and New York Times only 50 times, or about once per year. In the 45 years after the CIA memo, the phrase appeared 2,630 times, or about once per week. I simply checked the archives for both papers. Perhaps the archived articles pre-1967, the year the CIA produced the memo, don’t use the phrase of “conspiracy theorist”, but enough use the word “conspiracy”. There’re NYT and Washington Post articles dating back to the 19th century that’re about one conspiracy or another, or a conspiracy theory or another without necessarily using “conspiracy theorist” or “conspiracy theory”. Some evidently are about “conspiracy theory”, for there’s lacking evidence for proving real conspiracy. The Warren Report also spent very little time discussing the actual JFK assassination, and a great deal of space was spent on Oswald’s background and history and possible motivation. The original FBI report on the assassination was even worse that way. The phrase “conspiracy theory” is a typical PsyWar tool. Most likely it was created at one of the think tanks controlled by the CFR globalist conspirators. I have not read yet Ryan’s new book Another Nineteen, but I would not be surprised if all of the people he mentions as probable culprits of the 9/11 events are CFR members. Servando Gonzalez, author of Psychological Warfare and the New World Order: The Secret War Against the American People. I agree with what this article says but was expecting something more like your article entitled “Demolition Access To The WTC Towers”. For other readers of this post, the above page is an introduction by Don Paul for the 4-part article by Kevin Ryan on who had access to the WTC towers that would permit setting up or organizing demolition. It’s definitely an article (series) anyone appreciating the above article of May 30, 2012 by Kevin Ryan should make sure to read in full. YouTube channel WarCrime911 (J. Rys, aka AlienScientist) also has related videos people can find by simply searching YouTube using suspects and WarCrime911 for search terms, as well as “Marvin Bush” and WarCrime911, plus “Demolition Access” and WarCrime911. Some, if not all, of the content of these videos is based on Kevin Ryan’s “Demolition Access …” series. One of these titles uploaded by WarCrime911 is a multi-part video and the last time I checked, which is recently, it was up to 3 parts. I believe that that is the 9/11 suspects video and that the one he titled after Kevin Ryan’s piece is the first of these videos. It can’t hurt to listen to them all and in whatever order a person wishes. I recommend carefully considering the “Demolition Access …” article series and WarCrime911’s related videos. I just read this article for a second time and it’s rather excellent as well as important. Some links are no longer valid, such as links in the page of/for footnote reference #1 as well as the CNN link for footnote #4, but the latter is found with a Web search, and some of the links in the questions of the 9/11 Family Steering Committee (FSC) are also found with a little searching. Not all of the latter are found, but some definitely are. The present url for footnote #4 is the following one. The footnote #11 link for the 9/11 poll at scrippsnews.com is not working, but the home page also doesn’t load, so the problem possibly is just a temporary shutdown for administrative purposes. It’s unfortunate that pages for some of the links for the FSC’s list of questions can’t be found, or certainly not with any easy Web searches anyway, but the list of questions remains very good and a useful resource. The 911 Comm. Report, the complicity of the media, WTC7 destruction and disappearance has shown us what the capabilities are for, what Huxley called, the “scientific dictatorship”. Many of us have come to accept we are thru the guard rail – 80,000 swat raids on American homes in 2014 – what now? The pre-9/11 world is not coming back. For murder we prosecute and for terror we budget – every intelligence agency on the planet knew their budget would improve after the 2nd plane was hit. Killers are an ugly specimen – those who can silently watch killing are much much worse. Hi Kevin, interesting article and not because of the evidence it presents (which many of us are aware of) but by the question it asks of us that have investigated the events on the 11th of September 2001. Unfortunately, we do not have enough information to put together a solid theory. Yes you have gone along way to getting close to understanding who benefited, who had the access and the power to make it happen, but if you aren’t prepared to propose a theory, then who could? A group of investigators including some reputable journalist and such seems very unlikely at present…I like you live in hope one day it may be possible. We have seen over many years the case for the CIA being central to the JFK assassination firm as the ‘theory’, but still many other theories remain. We in the case of JFK have had been provided much more information and there have been far more whistle blowers come forward compared to 9/11. So I feel your hopes are on this basis are ill founded.